Sliding Webcam Privacy Cover for iPhone, iPad, Macbook, Desktop, Laptop, Smartphones, Tablets : allputer.com - Accessories for all your Portable Electronics & Computers! Did you know that hackers could access your webcam without your permission? Webcams can be hacked by a cyber peeper through any Internet-enabled device. Scary, right? Indeed, someone may be recording you right now! Do you leave your laptop open while you’re getting dressed in your room!? Do you leave your smartphone or tablet facing upwards!? Your actions could become public if your webcam becomes hacked. You can be hacked by clicking on spam, visiting a website that contains malware, or having chat programs running on your device. Protect your privacy by covering your webcam when it’s not in use. 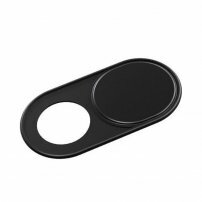 - Webcam Cover fits on all device, compatible with Macbook Pro, Macbook, Mac, Laptops, Surfcase Pro, iPad, Android tablets, PC, Computer, All-in-one desktop, iPhones and many more smartphones. - Ultra Thin design, not to add any additional weight and make bulky to your device. - Made of high quality ABS and Strong Adhesive tape, always protect your Privacy and Digital Security from spying and hackers.